We wish to THANK YOU for your generosity to the Mother Marianne West Side Kitchen. Your donations of monies and volunteer time have allowed us to serve over 40,000 meals to the needy of the area since our inception in March of 2008. While the 'soup kitchen' is a sponsored ministry of our parish, it is and will continue to be self-supportive, NOT using general funds of the parish. 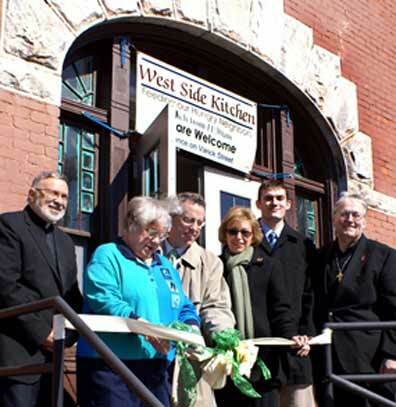 To date, West Side Kitchen has been supported by your White Pew Envelope Donations, community and private donations, as well as several grants from government and private agencies. With the grant monies, we have been able to upgrade our Parish Center kitchen and add much needed equipment and fixtures costing $22,000. These are all now assets of the parish, obtained at no extra cost to us. Tons and tons of food and supplies have been provided and paid for solely by donations, and federal and state grants. We have limited our kitchen operation to lunch hours only, Monday - Friday, so that our Parish Center will remain available for use by other parish groups. All evenings and Saturdays are open for other uses. The Sunday Coffee Hour, after the 10:30 mass, will continue offering food and fellowship to our parishioners and our guests. In these times of economic uncertainty, rising unemployment and growing social needs, we are offering a much needed service to our community. Offering hospitality to the needy is an integral part of what a parish needs to be in the Church and to the community. Our Bishop recognizes and appreciates our efforts to assist the needy. Local government has supported our efforts with recognition awards. The media has also taken a special interest with many supportive newspaper articles and TV reporting. Most importantly, your generosity, caring and understanding are what allow this all to happen for the benefit of God's people. We invite you to visit us any time to enjoy a meal, volunteer your time or just see what's going on. Thanks also to our Coordinators Board, our Kitchen Supervisors and our many loyal volunteers. Without you this could not happen. The need continues to grow... please continue to be generous with your support.